Savannah Chrisley is going to be a bride! 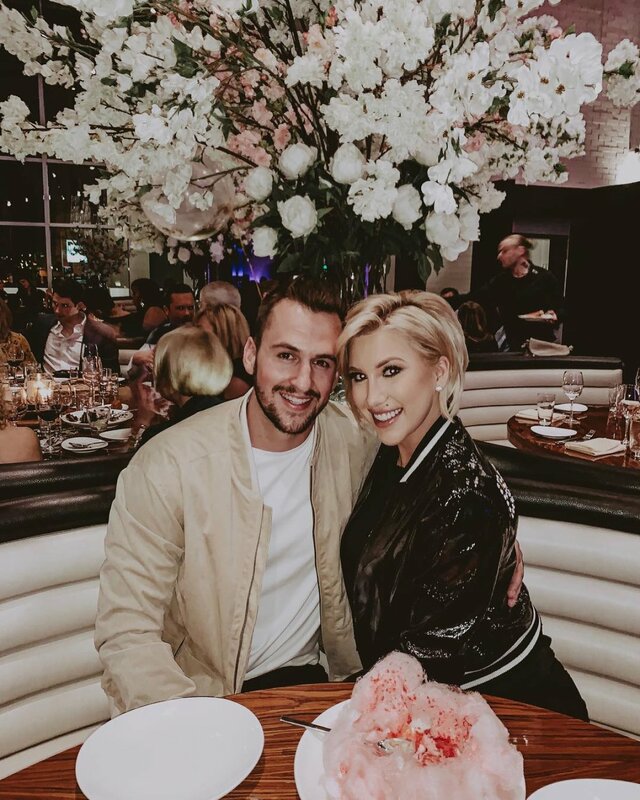 The Chrisley Knows Best and Growing up Chrisley star accepted a marriage proposal from her boyfriend of over one year, professional hockey player Nic Kerdiles, and now the couple is engaged. Savannah got engaged on December 24, 2018 in front of her family and friends at her home in Nashville, TN, but she's just now opening up to People about that special moment of her life. "[That night], Nic's family was in town and my whole family was there and we were filming and I was furious," Savannah, 21, said. "I was like, 'The fact we're filming on Christmas Eve is absolutely insane. I have people here.'" But Savannah was in for a huge surprise, as everyone knew what was about to happen except for her. "And then my mom said she forgot something at the store. So, I got in the car and went to the store with her. When we came back and we walked in the door, no one was there. Our best friend's kid, Dylan, goes, 'Hey, I think they're looking for you outside,'" Savannah recalled. "I walk outside and it's all lit up! And Nic's family is standing on one side, my family and friends are standing on the other, and then I just start freaking out because I'm like, 'This isn't really about to happen.'" Nic, 25, then reportedly asked Savannah to approach him. "Nic looks at me and he was like, 'Hey babe, will you come here?' And you can tell you he was so nervous, and I was nervous. That was a long walk. I was like, 'What is going down?'" Savannah explained to the magazine. "And then, it's funny. He tells me now that he forgot everything he wanted to say. He said he had this whole thing written out, and he was like, 'I just forgot it all.'" But Savannah said the proposal was "just so cute" and "everyone was crying." "It was just such a cool moment. And the fact that both of our families were there made it even better," Savannah shared. Savannah and Nic met on Instagram and have been dating since November 2017. Savannah was shown telling her family on Chrisley Knows Best that she thought Nic was The One and she could envision a future with him. And according to the reality TV star, she and Nic had discussed getting engaged before. "He sent me a picture of a ring on Instagram one day and it was hideous," Savannah said. "He was like, 'Do you like this?' And I was like, 'No, no.' I immediately sent him a picture of what I liked." Savannah's mom, Julie Chrisley, reportedly came to the rescue once it became time for Nic to purchase an engagement ring. "My mom actually kind of picked out the ring, and so she went and sat down with a jeweler in Nashville and picked out the diamond and all of that," Savannah revealed. "And so, it's kind of cool to know that she picked it out." The ring -- designed by Dror Flantzman in Nashville -- reportedly boasts a five-carat radiant brilliant cut diamond in the center, surrounded by 18 round brilliant cut diamonds on the band. And fans of the show are probably wondering whether Nic asked Savannah's father, Todd Chrisley, for his blessing and permission to pop the question. "It's funny because Nic wanted to ask them in person, but he was in Canada and we were all in Nashville," Savannah told People. "He FaceTimed my dad. My dad said he was so nervous when he FaceTimed him, that he asked my dad for his hand in marriage! And my dad was like, 'You may want to re-ask that question.' He was like, 'Do you want my daughter's hand in marriage or my hand in marriage?'" Savannah added, "Nic hung up the phone and called back, and then asked him the right way. And it was just so funny. My dad said he was so nervous." Although the couple is now engaged, Savannah insisted she's in no rush to get married. "We're taking our time," she said of the wedding planning. "Just because you're engaged doesn't mean you have to get married tomorrow, so, we're kind of just taking our time. We know that we want to spend the rest of our life with each other.'" Savannah is also busy with her new Chrisley Knows Best spin off, Growing Up Chrisley, which also stars her 22-year-old brother Chase Chrisley and just premiered Tuesday night on USA Network. In the new series, Savannah and Chase are shown leaving Nashville and moving to Los Angeles, CA, together to pursue their dreams. Savannah hopes to create her own brand of cosmetics and fragrances, while Chase wants to become an actor. Todd and Nic will also make appearances in the siblings' new show. Todd Chrisley on 'Chrisley Knows Best' reaching 100 episodes: "It's our life, it's our truth"